As a child, I used to have this recurring fantasy where I had a diverse make-believe family filled with exciting relatives. Most of the roles were expendable and all the actors interchangeable, but two roles were always constant: Uncle, played by Robert DeNiro; and Grandma, played by Random White Lady. Random White Lady was an amalgamation of every white TV and movie grandma I had ever seen. She had the snow-white grandma afro and big glasses. She sounded like Tweety Bird’s grandmother. She wore an apron and house slippers. Her nickname was Nana. She baked fun-shaped cookies, brought presents every time she visited, and sent $25 checks in the mail. She was doting and spoiled us (read: me) rotten. She was everything my grandmother wasn’t (at least the one I knew). The most vivid memory I carry of my real-life grandmother: she is asleep; my older brother and I are hiding at the foot of her bed, tickling her feet. When she twitches or lifts her head, we duck. We do this repeatedly til we are caught; she yells, we flee, giggling. I never met my maternal grandmother. My paternal grandmother died when I was 11 years old, but I only spent a maximum of three years in her presence. In every faded memory I have of her she is sleeping. I don’t recall ever having a conversation with her; by the time I got to know her, she was mostly deaf. Her distorted speech, combined with her thick Shaygi** accent made her, to me, impossible to understand. To be honest that, and her general distanced nature (or what appeared to me as so), made me scared of her. We received word of her passing on a Saturday. I walked into the livingroom of our New York appartment to find my mom and dad sitting close together on the couch, quiet. My mother told me the news as silent tears rolled down my father’s face. I remember thinking, “why is he crying? we barely knew her”. I could not fathom that my father’s relationship with his mother could be deep, because my relationship with her wasn’t. I felt nothing at my grandmother’s passing – it was like a complete stranger had died. Years later and I still carry with me the guilt of my indifference towards her death. I learned my grandmother’s name when I was a teenager, and it was by accident. My father breathed a tired sigh one day and said, “ah~ yumma alSayida” (oh~ mother Sayda). It took me a while to figure it out, and I felt ashamed when I finally did. To this day, I don’t think my father knows that I didn’t know her name. To me, she was alhajja – I don’t remember ever calling her grandmother. Knowing her name ignited something in me, like she was no longer theoretical, and her name and memory were suddenly beautiful. It was around this time that I began to realize the difference between the western idea of grandmother (I call it that because all I have to go on is scripted grandparent-grandchild relationships) and the Sudanese reality that I lived. A reality where grandmothers are more like lawmakers than cohorts; their presence is revered and, in my case, feared. Little kids tiptoe, whisper, and do whatever it takes to avoid disturbing the grandmother. The sheer size of families (and, as a result, the sheer number of grandchildren) meant that there was no possibility of a one-on-one relationship; no “grandma’s special kid”; no heart-felt talks; no safe confessions with hugs and cookies afterwards. As the years went by, I became more exposed to Sudanese families other than my own, particularly ones with living grandparents, and my self-constructed idea of Sudanese grandmother-grandchild relationships began to crumble before my eyes. Here we had people who went to visit their grandmothers every weekend, who sat around for story time and who, you know, shared stuff with their grandmothers. Not only that, they knew their grandmother’s name! and not only did they know her name, they had other names to call her by – special names! Names like haboba, yumma, teita, and yes, even nana! I was angry. And jealous. And I wanted a refund. It made me bitter that I had missed out on a seemingly great life experience, and so I tipped to the other side of the balance: whenever I was confronted with a discussion about grandparents, I (almost boastingly) announced that both sets of my grandparents were dead. In my mind, this justified not only my ignorance on the subject, but also my deep defensive detachment to it. At my older and (hopefully somewhat) wiser age, I’m allowing myself to cut my grandmother, and me, some slack. The curves of our lives connected at inverse points – I too young to appreciate what she had to offer, she too old to offer me as much as she might have liked. Instead, I have learned to find comfort in the stories told to me about both grandmothers. I will learn about them from the people who knew them best – their children. I accept the uniquness of our relationship, and cherish it. Hajja AlSayda, this is for you. 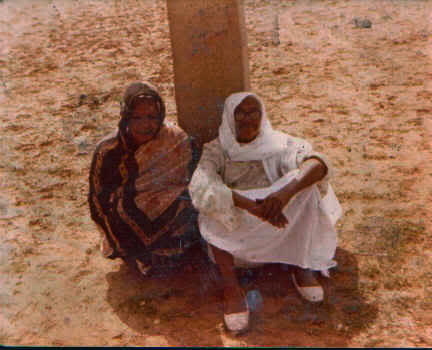 My grandmother (right) waiting for the bus to be fixed on the way back to the village from my uncle’s wedding. ** Shaygi is the language of the Shaygiya, my father’s tribe. Tags: family, grandmas, grandmothers, memories, relationships, Sudan. Bookmark the permalink.